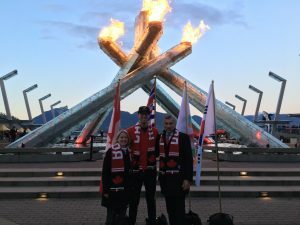 Minister of Tourism, Arts and Culture Lisa Beare lit the Olympic Cauldron on Thursday night to honour B.C. athletes competing in the PyeongChang 2018 Olympic and Paralympic Winter Games and salute the start of the Games in the Korean host city. Olympic medallist Brent Hayden and BC Pavilion Corporation CEO Ken Cretney joined Beare at the symbolic lighting. Two hundred and twenty-five Team Canada athletes participated in this morning’s Opening Ceremony in Korea. Sixty-three Team Canada athletes have a B.C. connection, and 32 of those were born in the province or have a hometown here. Many of those and others train in B.C. and receive support from the Canadian Sport Institute Pacific or viaSport Regional Alliance partners. The B.C. government invests more than $50 million annually in sport. This includes funding for provincial sport organizations that develop athletes and coaches to progress from provincial to national teams and competitions. The Olympic Winter Games take place Feb. 9 to 25, 2018, followed by the Paralympic Winter Games from March 9 to 18, 2018, in PyeongChang, South Korea. Sixty-three athletes have a B.C. hometown or birthplace and/or train in B.C. with Canadian Sport Institute Pacific. Nineteen athletes are BC Games or Team BC alumni (16 are BC Games alumni, 15 competed in the Canada Games and are Team BC alumni, and 12 competed at both the BC Games and Canada Games). B.C.-connected athletes are participating in 11 sports and 17 disciplines, including: alpine skiing, biathlon, bobsleigh, figure skating, freestyle skiing, ice hockey, luge, skeleton, snowboard and both speed skating disciplines, short track and long track. Sixteen B.C. communities can boast of having an Olympian on Team Canada in PyeongChang this year: Alert Bay, Campbell River, Chilliwack, Comox, Coquitlam, Courtenay, Cranbrook, Kelowna, New Westminster, North Vancouver, Penticton, Prince George, Richmond, Vancouver, Vernon and Whistler. Eighteen coaches have direct connections to eight B.C. communities, either as their hometown or a place where they are working. Five sport scientists and one communications professional from Canadian Sport Institute Pacific will be attending PyeongChang in a work capacity. Team Canada’s chief medical officer, chief doctor and two other medical practitioners are registered with SportMedBC. During the Sochi 2014 Winter Games, B.C. athletes brought home eight medals (two gold, five silver and one bronze), with B.C. athletes representing 19% of the total number of participants from Team Canada.